In one of my project, I was stuck while uninstalling MOSS from one of the servers. After struggling with the issues, I found some solutions that were helpful in resolving the issue. I am putting those resolutions that may be helpful for you also. I found four way to remove the server from MOSS server farm. First one is disconnect by running the configuration wizard from the start menu. This is the same way to use if you want to leave MOSS 2007 installed on the server but disjoined from the farm. 1. Run the Configuration Wizard and, on the second page, select Disconnect from this server farm and click Yes on the warning dialog. 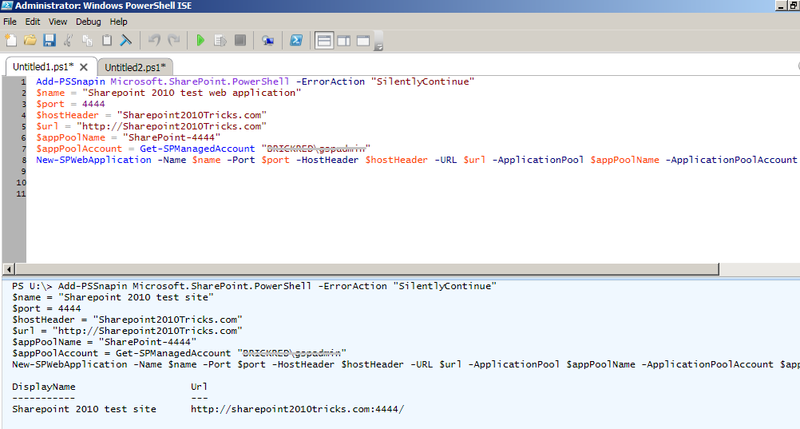 This will delete the IIS web site and the application pool. 2. 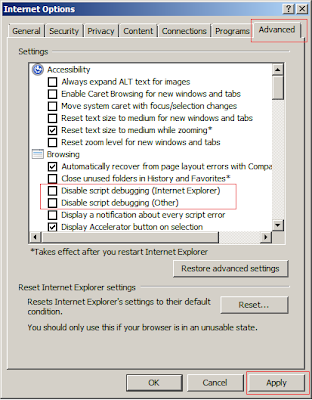 Then, run the uninstall from the Control Panel's Features and Programs application and click Yes on the warning dialog. This will take a reboot. Second on is removes the server if you want to clean up the serer when it can contact the configuration database. This method also uninstalls the SharePoint from the server. ​Use Add/Remove Programs in the control panel. In "Add/Remove Programs", you can remove "Microsoft Office SharePoint 2007", and it wills pop-up a warning, Click Ok to continue. The third method is removing the server from the server farm in the SharePoint Central Administration site. This way is easy and quickly, almost no latency, the action was completed. But this way don’t disconnect the server from the SharePoint database. Actually, I do server remove by the third and last one method, remove the server from MOSS farm by Central administration site, and then disconnected the server from configuration database. It is easy and cleanly, and without reset anything/reboot machine. Quite often during deployment in sharepoint projects, we come across a requirement wherein we have to create a no. 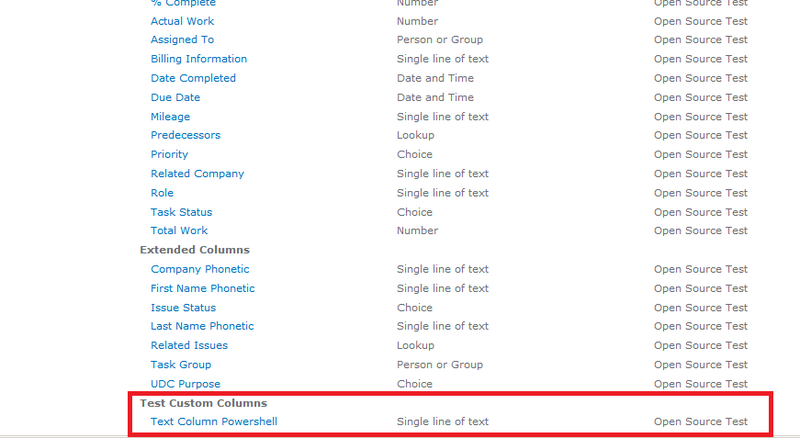 of site columns and content types on the root site of the site collection. If done through the UI,this task takes some time and is also prone to errors. 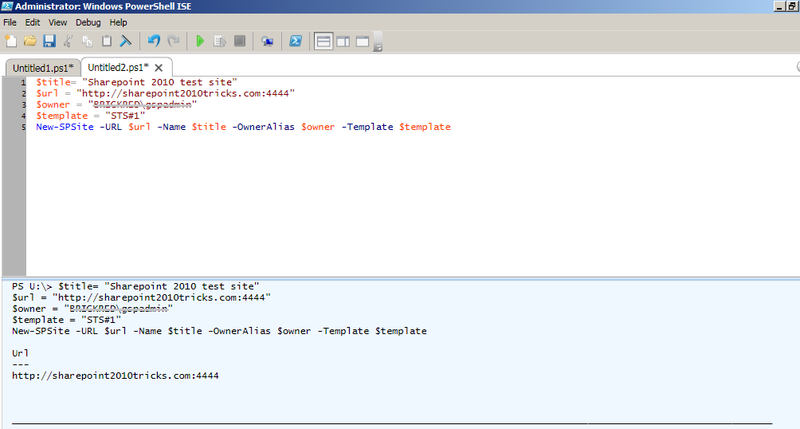 This can be done in a repetitive fashion easily using powershell scripts. 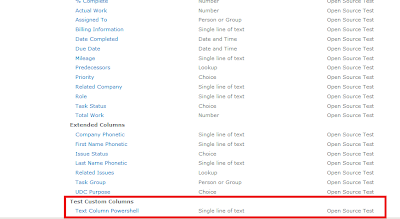 This powershell script shows how to create a site column using the field xml for the site column. can be propagated to all site collections. 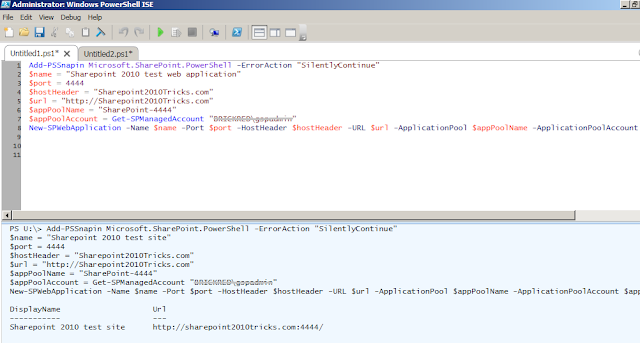 $siteColl = Get-SPSite -Identity "http://br-pc-341:2222/"
Description="This is a single line of text column created with powershell script." In this article I will show you how to use custom webpart as a replacement for NewForm.aspx or EditForm.aspx. Sometimes we have a scenario like we have a dropdown box and the data-items coming for this dropdown has to come from a SQL Server database or some other database. Or we have some business validations to put on the controls present in NewForm.aspx page or Editform.aspx page i.e. in List Forms. So to tackle these kind of situations we need to customize our List forms. We can customize the List-forms in two ways. · Change the Listforms with custom webpart which is having all your business requirements and a mechanism to add or edit items in List. 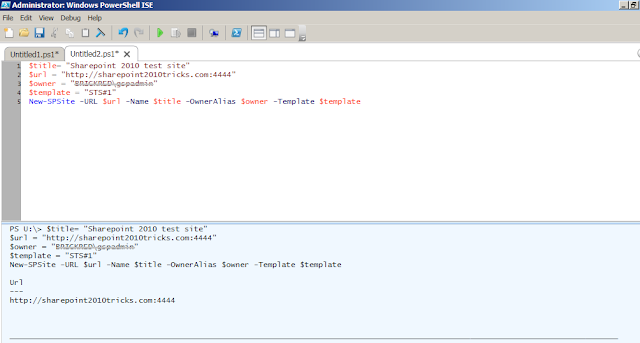 This custom webpart we can build in Visual Studio through Sharepoint Object Model. In this article I will tell you how to change the newform.aspx or editform.aspx with custom webpart. Here I believe that you all know how to build custom webpart for Sharepoint 2007. We are getting NewForm.aspx page. Now to change the list forms with some other webpart we need to edit the page in the same way which we are doing for a normal web part page but the problem here is we do not have Edit Page option under Site Action tab. Now what to do? How to open edit page mode? The answer is very simple and little bit tricky also. just add ?&Toolpaneview=2 above URL. Now your URL becomes like this. Just close this webpart and add your new custom webpart here. So after that whenever you will click on new button for adding a new item you will see your custom webpart instead of default Newform.aspx page. In the same way we can change editform.aspx page with our custom webpart by adding the ?&Toolpaneview=2 to the url. Hope this article would be a help to you. Many a times we are into a situation where we have to apply some validations on the custom browsable property of a webpart and if the value in the property is not valid than we need to show Exception message in the ToolPane of the webpart itself. We can validate these properties and can show the exception message also. To do this we need to put the validation part in the “SET” part of Property definition itself as show below. Suppose we have to create a property which will accept the XML strings only and we want to restrict the user to enter invalid XML string and show error message on the ToolPane of the webpart. This requirement we can achieve by using Regular Expression. Below is the code snippet by which we can do this. In this way we can validate the browsable property of the webpart. Ensure that the two options are not checked (refer to the below screen shot). 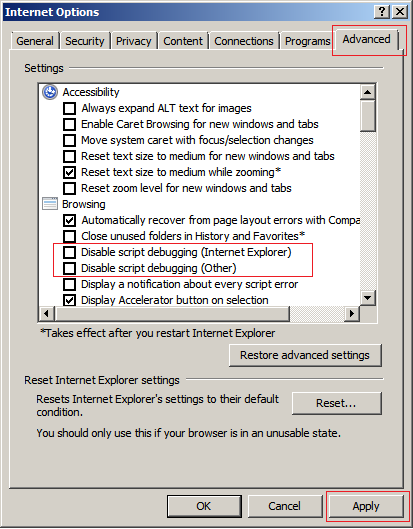 There might be the case that even after doing above settings, you are not able to attach the debugger. For this you may need to check the Registry key for the appropriate dword settings. Set the HKEY_CURRENT_USER\Software\Microsoft\Windows Script\Settings named value JITDebug to 1 (DWORD). Note: You might have to add both the Settings key and the JITDebug key if its not already there. Sandbox framework provides excellent way for farm administrators to validate solutions that run in the sandbox. Farm administrators need to deploy sandboxed solution validator that run when a sandboxed solution is uploaded to a Solution Gallery. Sandboxed solution validator is called when a solution is activated. The validator class inherits from SPSolutionValidator. We need to override ValidateSolution and ValidateAssembly methods. The ValidateSolution method is called once for each solution, and ValidateAssembly is called once for each assembly in each solution.